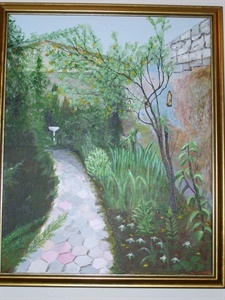 This portfolio is of paintings (both acrylic and oil) painted from photographs which I took during my stay there. 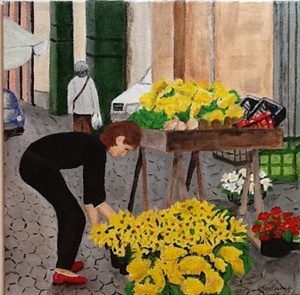 I attended an art workshop (Adventures in Italy) with artist, Jill Berry. 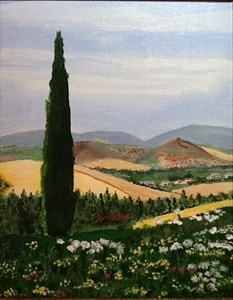 It was a magical place and I hope to record 10 or 12 of my favorite images from Orvieto. The cathedral of Orvieto, Italy, as seen from the street leading to the piazza. I stayed at the Instituo San Lodovico which is now a bed and breakfast run by two nuns. The building has sections dating back to the 1200s and is a peaceful retreat. This is the upper garden. 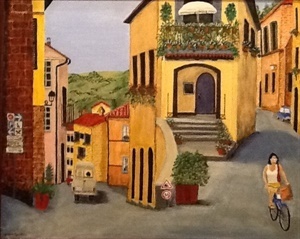 This is a typical downtown street scene in Orvieto. The streets are narrow and sometimes the buildings connect over the street. 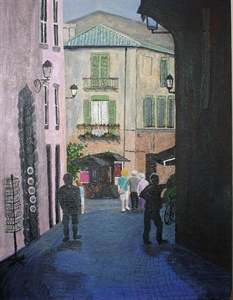 This is a typical street with tourists checking out the shops. The buildings had charming little balconies, often filled with flowers. Orvieto, at sunset, from "off the rock". You can see the Cathedral and most of the town. It has been inhabited for over 3000 years. 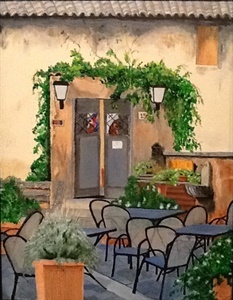 A wonderful little courtyard which was empty in the morning, but full of life in the evening. 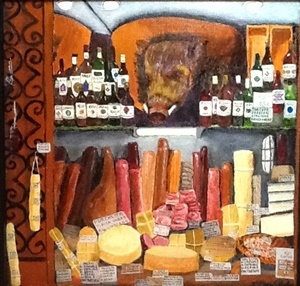 I was fascinated by the shop window with the wild boar head, wines, meats and cheeses. And chingali (wild boar) was the only meat that I had the week I was there. Conflux - Up or Down? 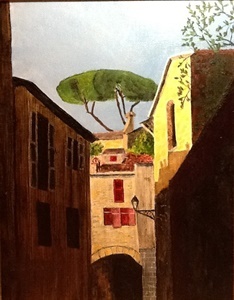 The streets of Orvieto are narrow and used by both pedestrians, automobiles, and cyclists. The central building is interesting since on one side the street goes down, while on the other side it goes up! 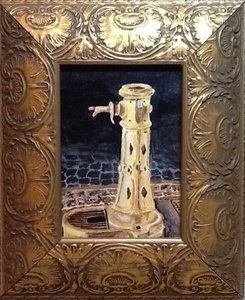 This work of art was a simple water spigot in use on the street. It glowed golden at sunset. 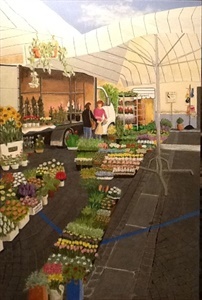 This was a small and simple flower stall. 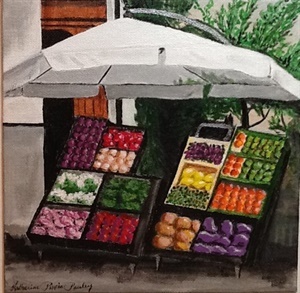 The colors of the fruits and vegetables. This lovely view shows the Umbrian countryside from the Palazzone Vineyard where I enjoyed a lovely evening drinking their wonderful wine. 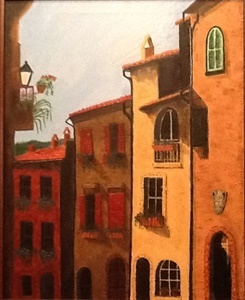 This is a marvelous little street where the Michelangeli Studios and shop is located. They have wonderful wooden creations--marionettes, benches, horses--you can see many of them along the street. The wonderful wooden carvings of the Michelangeli Studios can be seen over the doorway and on the benches and horses along the street. 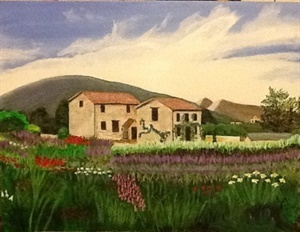 This stone farmhouse is surrounded by a sea of flowers--lots of beauty in the countryside. 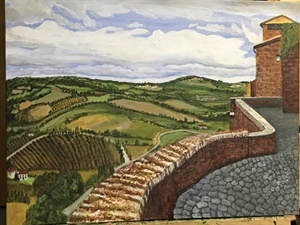 This large painting is from an overlook on the city wall. The countryside is full of small farms and vineyards. 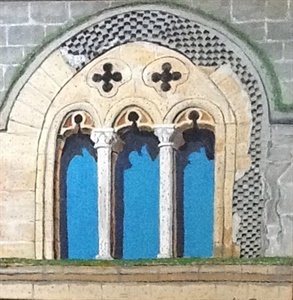 Most of the buildings in Orvieto are made using the tufa stone of the mesa on which it is built. There are tunnels under the current town where you can see rooms from previous centuries of occupation. I was fascinated by the very large trees which looked as though they were manicured into shape--no branches out of place. This lovely window reflected an almost turquoise sky. 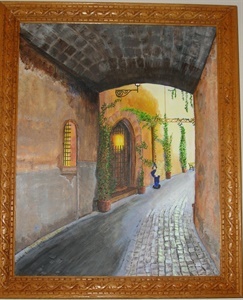 The old city gate which was below the convent where I stayed. One morning we stood on the wall above the gate to paint. We could only see the top of the gate. 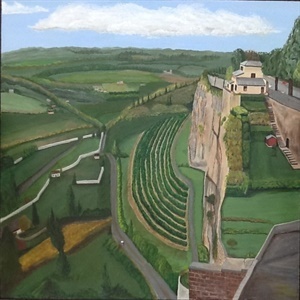 Acrylic painting of the Umbria countryside from Orvieto.